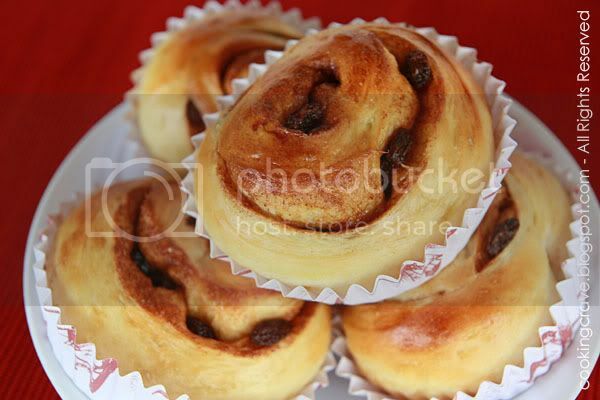 If sausage buns are my kids favourite then my favourite buns will be these "Sweet Cinnamon Raisins Bun". I just can't resist the sweet smell of Cinnamon all over my house when I bake it in oven. I like to have it with a cup of freshly brewed warm coffee and of course together with some girlfriends for our girly talks. That's how I describe a wonderful afternoon :) I baked Cinnamon Rolls before, at that time I just hand to knead the dough and it really takes me like whole life to get the dough elastic and ready. I didn't give up tho, but the texture of the buns sure cannot compare with the one knead with breadmaker, it's more fluffy and soft. The texture of the buns remain soft for the following 3 days. I use the Basic Sweet Bun Recipe that I use for the Sausage Buns. Just follow the recipe there but omit the sausage and for it's filling I use ground cinnamon, brown sugar, raw sugar and raisins. Mix all the ingredients for filling in a small bowl. Weight the dough into 60gm small portion. Roll it into 2" x 5" rectangular shape. Spread the filling mixture evenly with the raisin evenly place on the dough and roll it up like spring roll. Cut it with scissors at the center of the roll up dough and fold it up. Place the dough (the cut surface face up) into the paper cup. Bake in the preheated oven at 180c for 12-15mins. 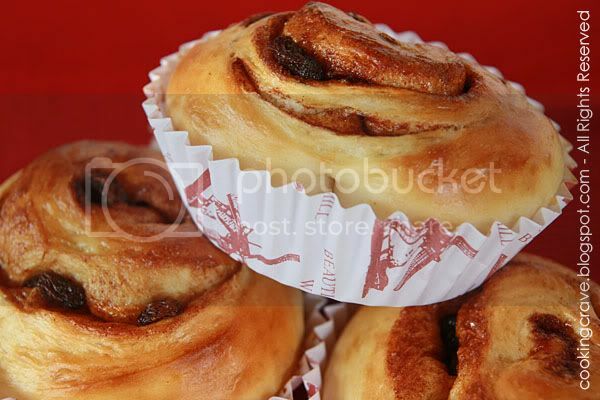 p/s: For more Cinnamon Bun Recipe or idea of it's filling. 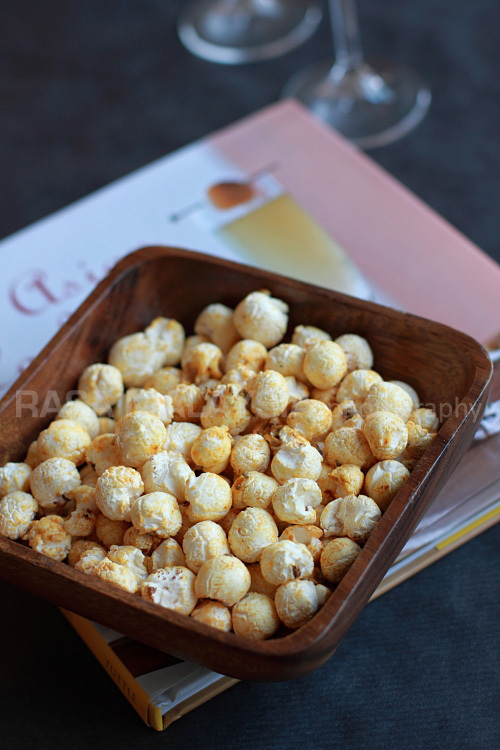 Please visit Kitchen Corner - Grace's Blog. 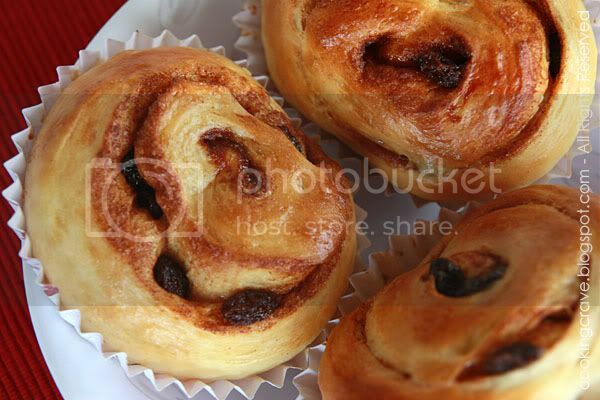 I like her recipe of soak the raisins in RUM and the use of honey for the fillings. I will definitely try out her recipe soon!!! wow.. we're making something similar in the same time. Your buns looks good! as usual, nice pictures and nice buns. Wow, I just discovered your blog and I'm loving it already! Such nice pictures! ;) Almost can bite into it, haha! Your bread and buns looks great, thanks for sharing, shall try it when I get the chance.